They say good things come in threes. 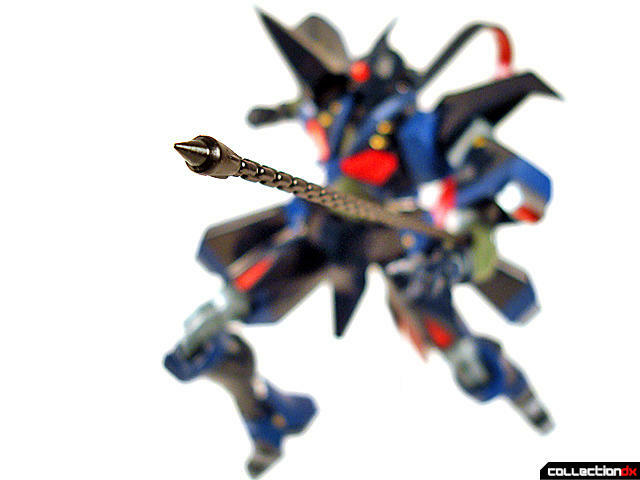 Well, Bandai's Soul of Chogokin Tobikage releases are proof of that. 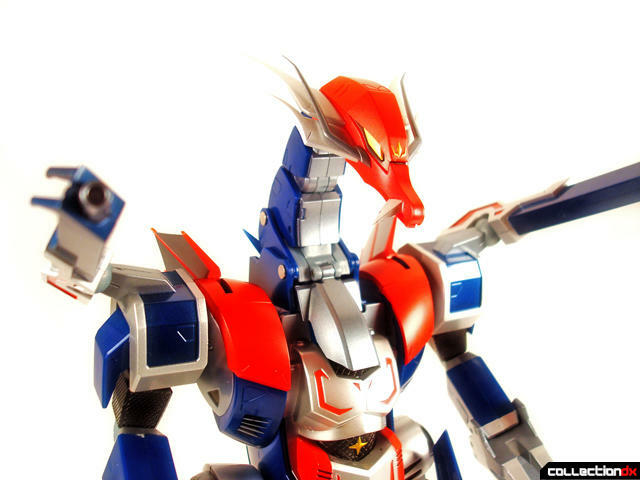 Starting with the GX-54 Tobikage & KuroJishi, followed by the GX-55 Tobikage & Houraioh and finally ending with the GX-56 Zerokage & Bakuryu, which is the star of this review. 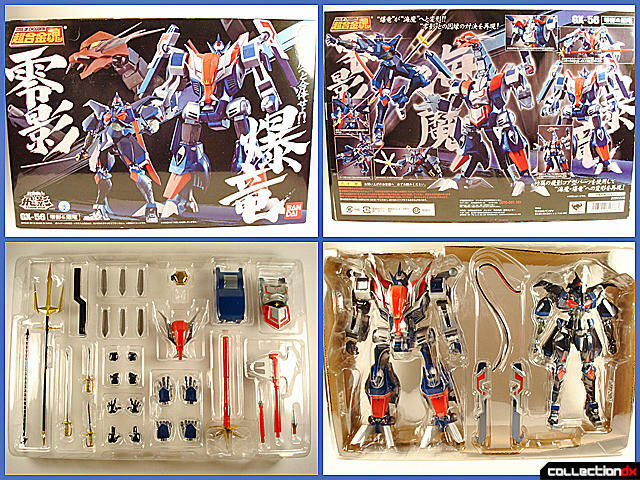 The GX-56 comes with the same style box as the previous two releases. That is to say it comes in a full-gloss thin cardboard box with wonderful graphic design depicting the greatness that lies inside. Inside of the box, you will find two trays. One with the accessories and one with the figures themselves. 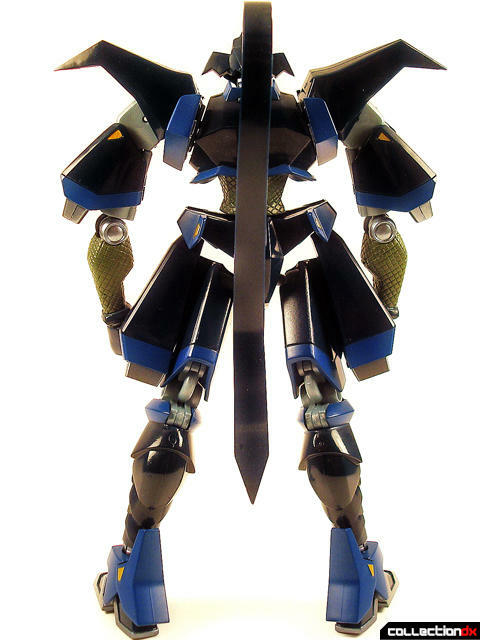 First up is Zerokage, which is another ninja-style robot similar to Tobikage. 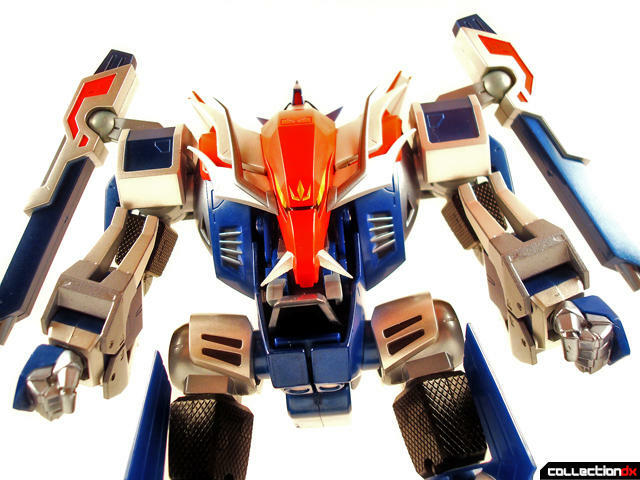 He is much darker in color but retains the overall same feel as Tobikage. 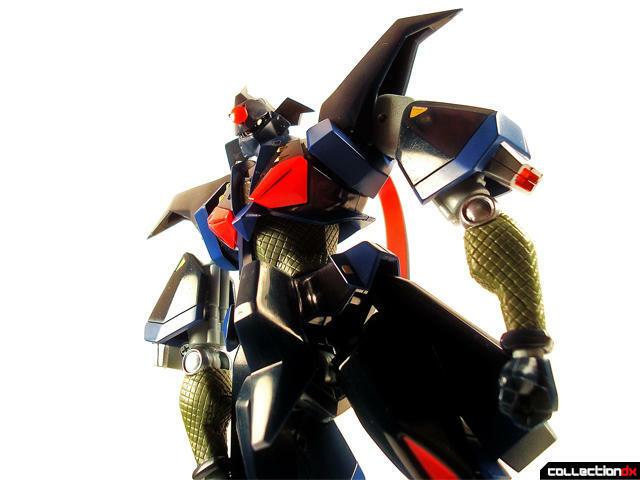 This version is a full size version not unlike the Tobikage found in the GX-55. The only diecast you will find on him is his ankle joints and feet. This figure would be great even if sold on his own. He has a good heft even though he lacks a lot of diecast. It seems as though the darker plastic parts are molded from solid chunks of heavy plastic. 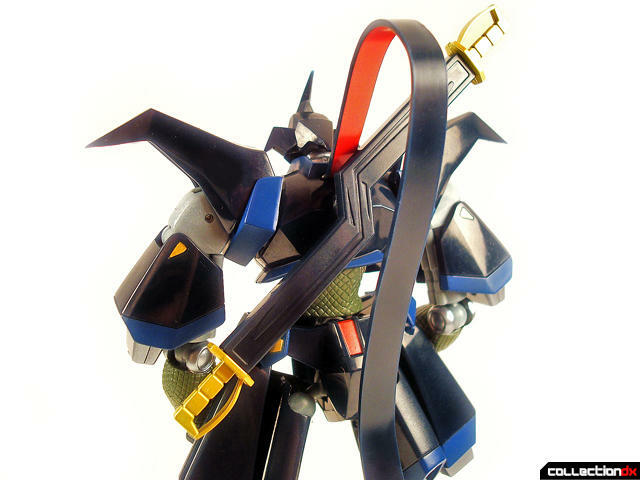 Here we see the back of Zerokage with his signature ribbon that comes out of his back. It is made of soft PVC to avoid damage. 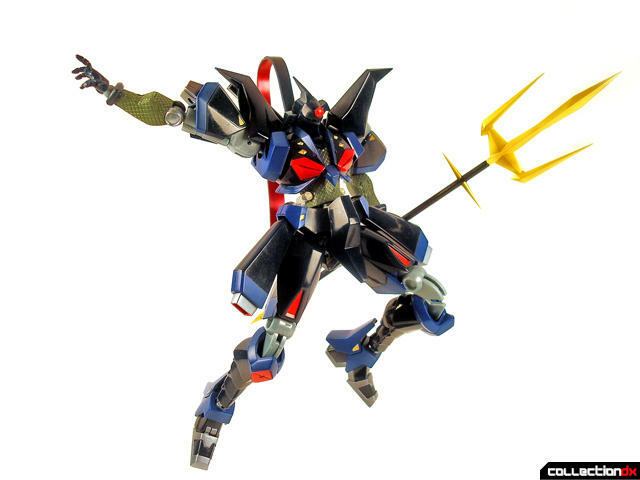 He has many points of articulation which allow a variety of poses. The upper chest and waist are separate from the mid section so you can pull of some mean crotch thrusting. 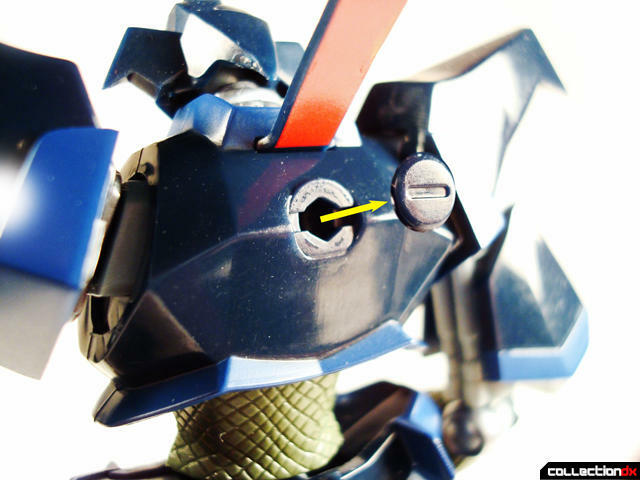 Up close you'll notice he has a very simple angular look very similar to old samurai designs. While a bit hard to see, he has these tiny little golden eyes which give him a very intimidating look. He has very pointy bits on his head which if not made of soft PVC, they would snap within seconds of handling. 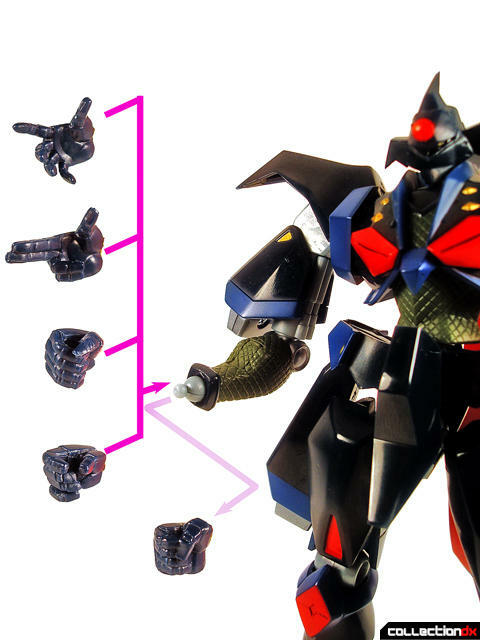 He has a variety of alternate hands to accommodate any pose of your choice and make holding weapons possible. 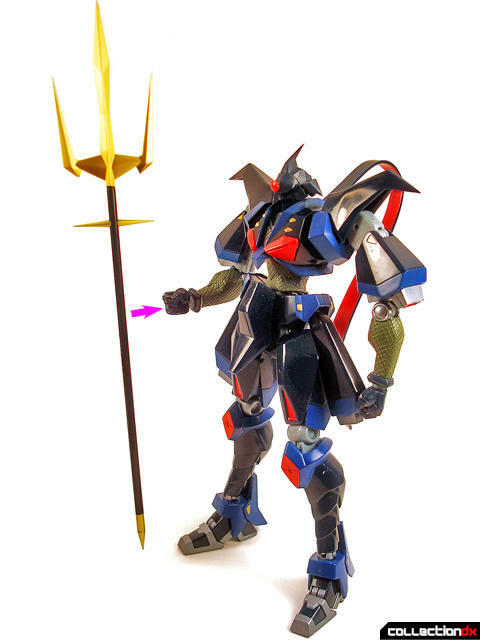 Zerokage comes with a trident weapon to fend off foes. He also has some swords. Two short swords and one longer sword which fit nicely into his weapon holding hand. 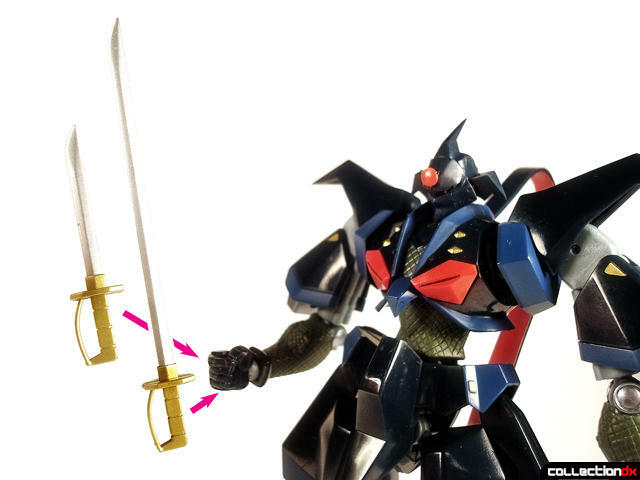 Zerokage comes with two sword holding hands so you can have him slice and dice twice as fast. And when not in use, you can store the swords in a double ended sheath on his back. To use the sheath, you must remove a cap on his back. Once removed, you can place the sheath on his back. Now that you have the swords away, the ninja star can come out and play. 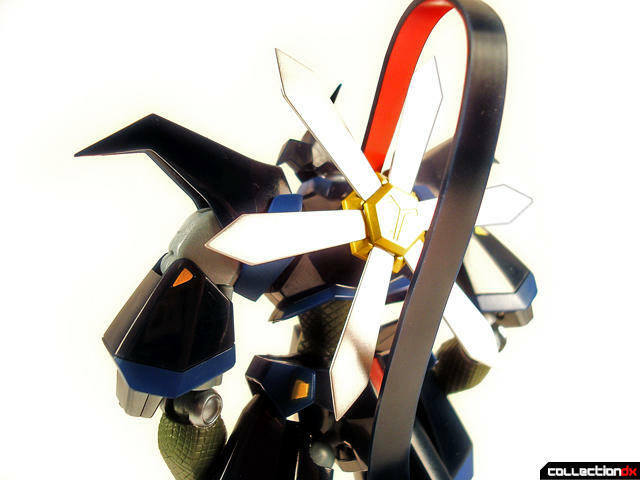 Each blade you see can separate itself from the center base. 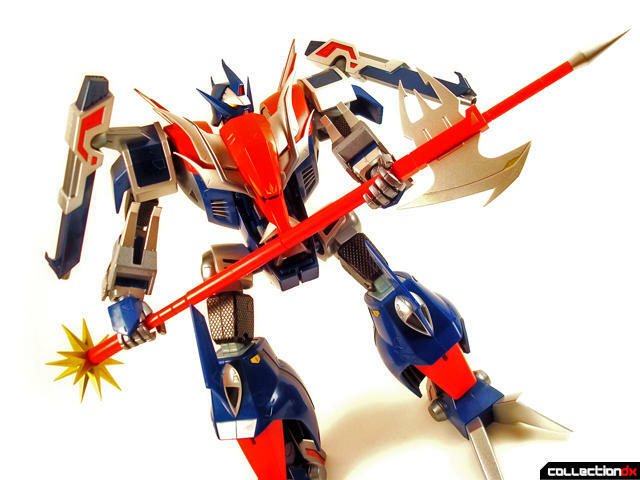 Like the swords, the star can be stowed away on his back. 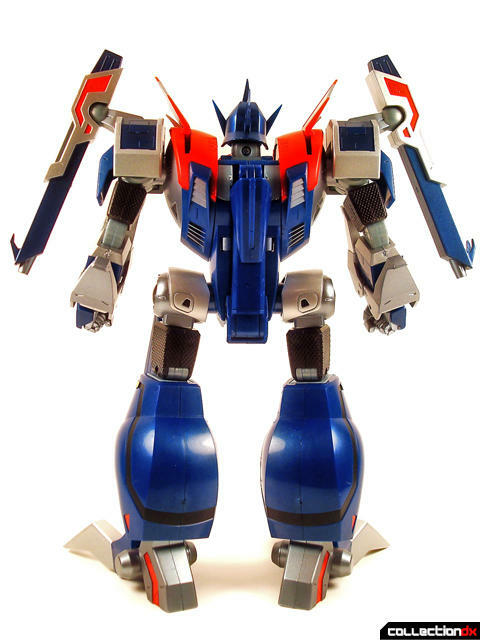 He also has a chain-type weapon that shoots out of his wrist like Spiderman. 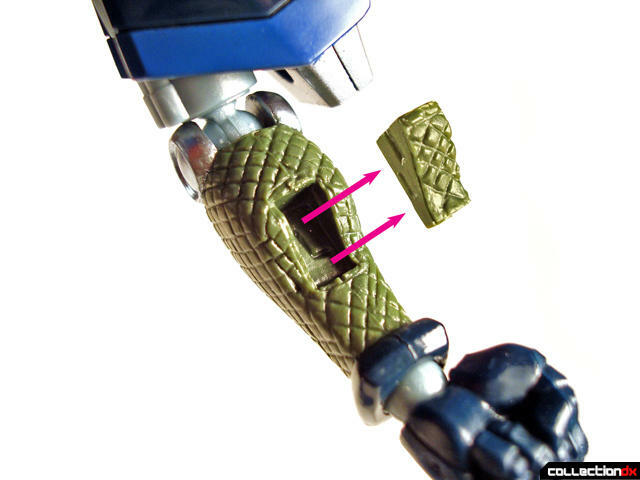 To use this gimmick, you must remove a small panel on his inner forearm. Be careful, it's tiny. Next you attach the end of the chain gimmick to the wrist. Since it is molded straight, it allows for some dramatic poses. 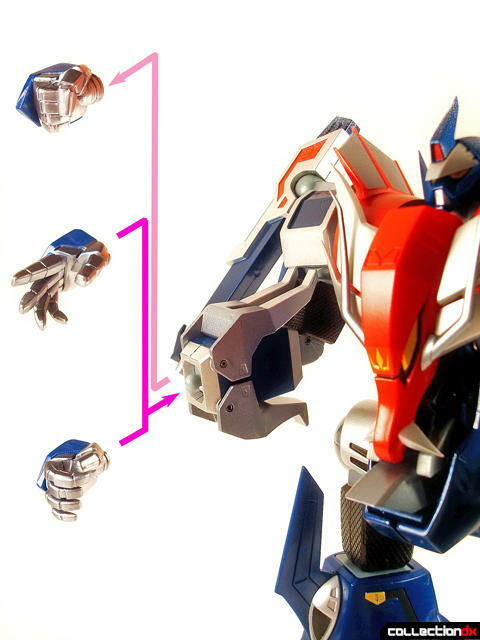 The great thing about the Zerokage figure is that it is highly poseable which makes for lots of fun action posing. Using a stand really steps things up. This set just keeps getting better and better. 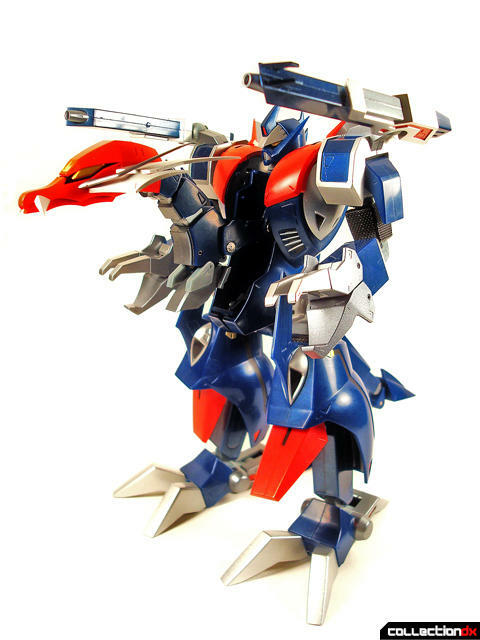 Not only do we get a very nice rendition of Zerokage, but we also get an amazing rendition of Bakuryu! This thing is menacing. Diecast is not what I consider abundant, but it is placed in where it makes sense. 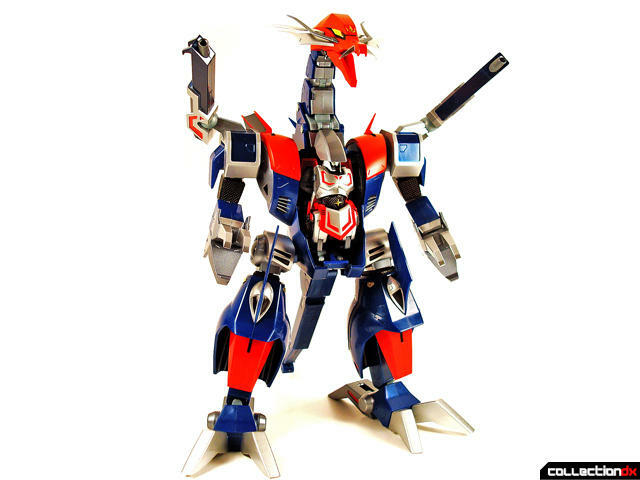 The center of the chest and back, arm claws and foot claws. Any more and it would have caused many complaints due to scratching or lack of precision. Overall still as heavy as it looks. I did not pick up the figure and think "wow, it's light for it's size." Bakuryu is simply stunning all around. When we look at his face, we know instantly that no knock-knock joke will ever make him laugh, no matter how funny it is. Its full of sharp and pointy angles. 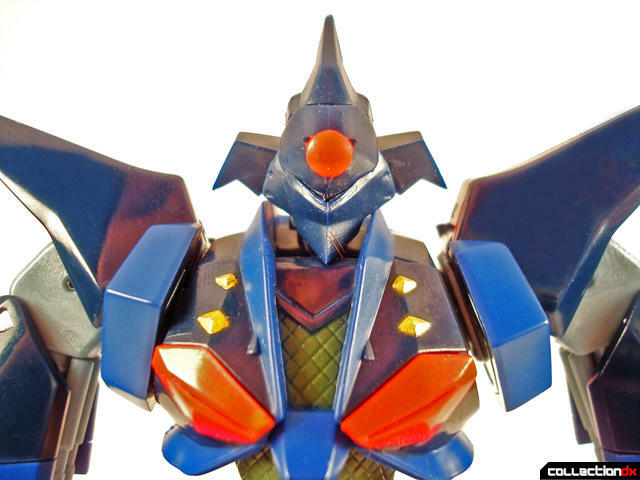 See those webbed shoulder fins? You'll want to be very careful with the three red points on each as they seem very susceptible to being snapped off. 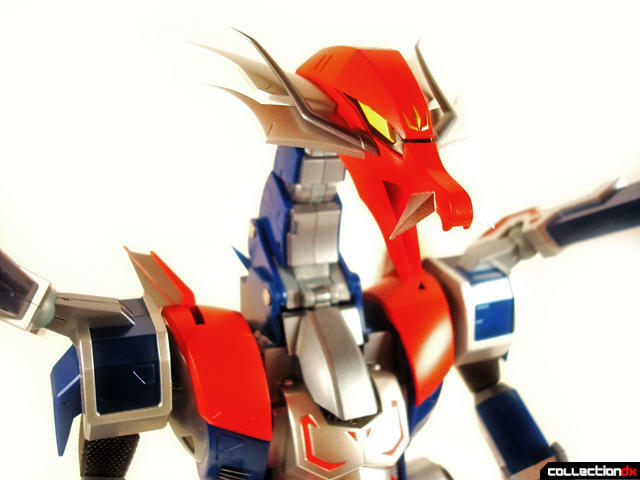 From this view, we get a good look at the dragon head on his chest which looks really cool. 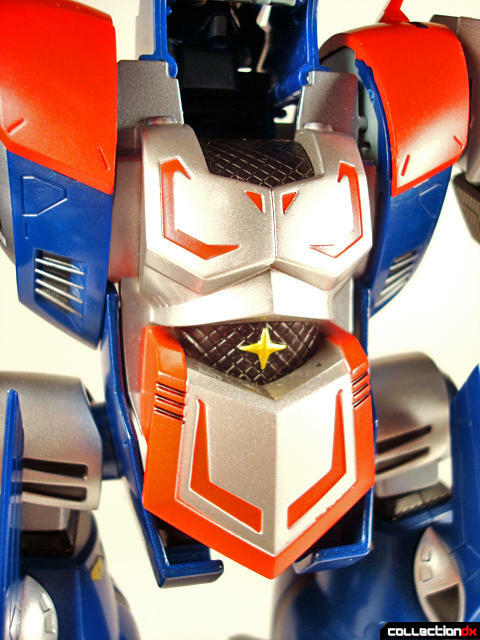 Some of the coolest robots we know have heads on their chest. How many can you think of? 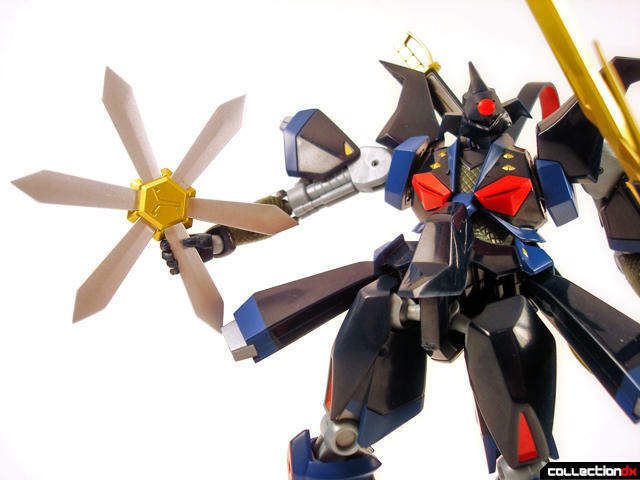 Like Zerokage, Bakuryu comes with alternate hands, although not as many. For weaponry, he's got this axe. And that's really all he'll ever need aside from the blasters on his shoulders. 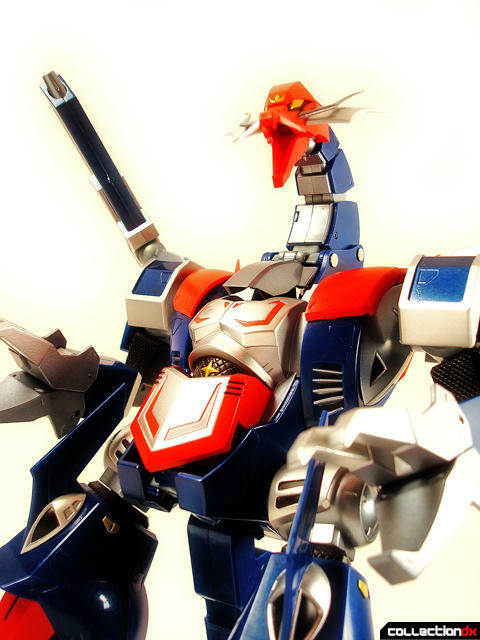 Bakuryu and Tobikage combine together to become Kaima ("Sea Demon") Bakuryu. Tobikage? Yes, Tobikage. You might ask "Tobikage is included in this set?" Well not exactly. 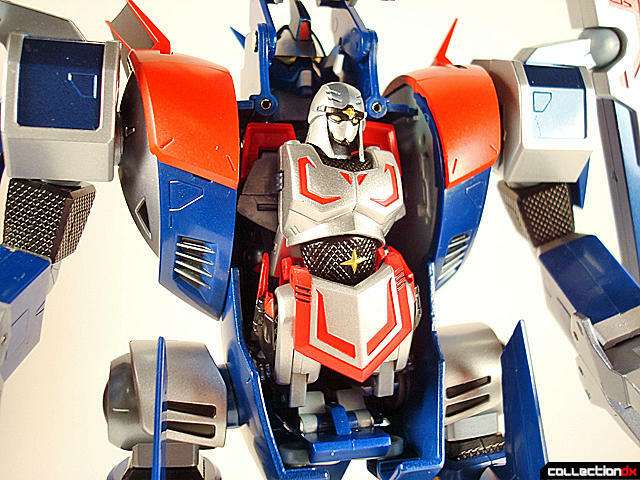 What this set does come with is a chest plate to simulate the inclusion of Tobikage in his combined form. Here is an up close look at how it fits into the chest. 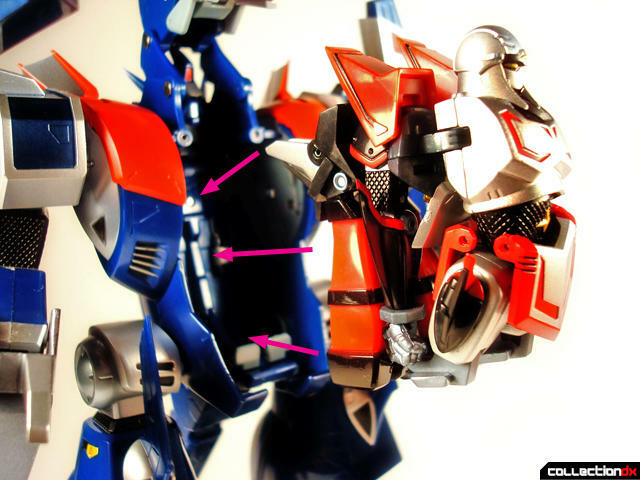 After putting on the Tobikage chest plate, you'll want to clip on this backplate to complete the look. 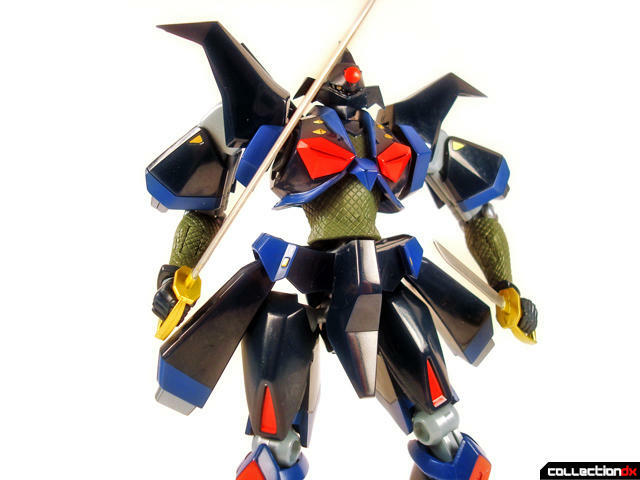 Here he is with the Tobikage chestplate. Not at all convinced that using a chest plate to simulate the inclusion of Tobikage is the correct way to execute this release? 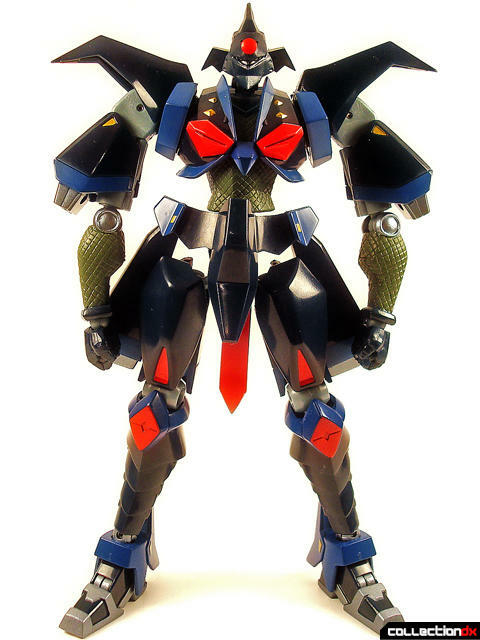 Well, what if I told you that you can also use the Tobikage from your GX-54? It fits very well into the chest. All proper clearances have been well thought out and designed. 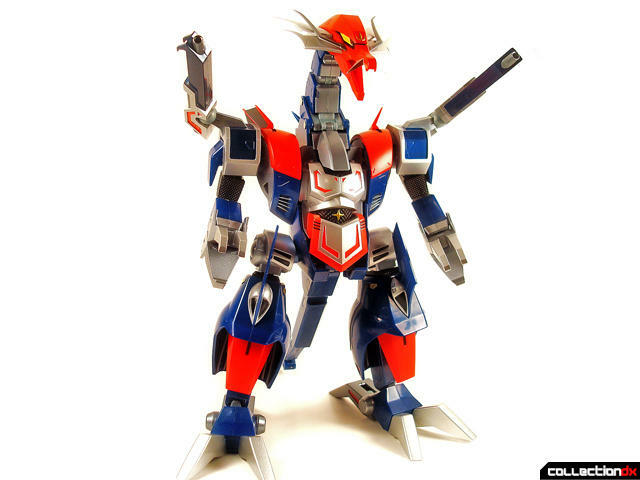 This is what you are left with using the GX-54 Tobikage. 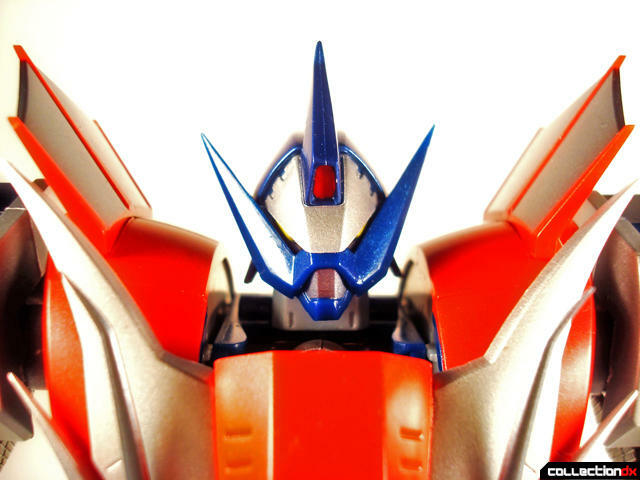 Although the face flap on Tobikage looks like it doesn't cover his face, it does perfectly. Apparently during photographing the figure it moved. Is this head looking a little too big for you? 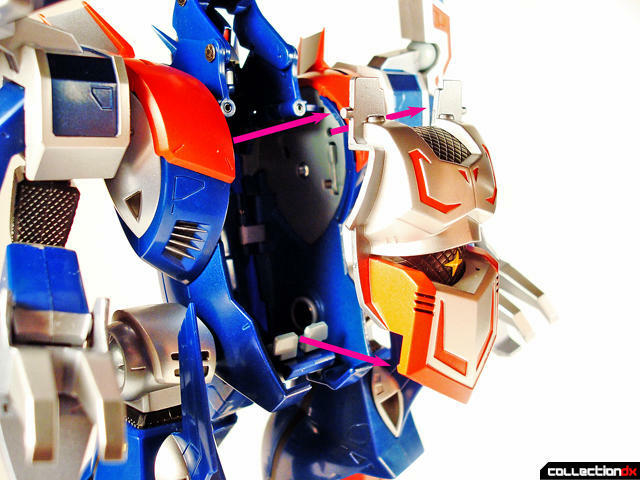 Well, you can always swap it out for an included anime accurate head which is a tad smaller but makes a big difference. That just about sums up this review. To fully appreciate the series, you should own all three Tobikage editions. However even only having one or two out of the three will suffice as each piece is excellent in it's execution. 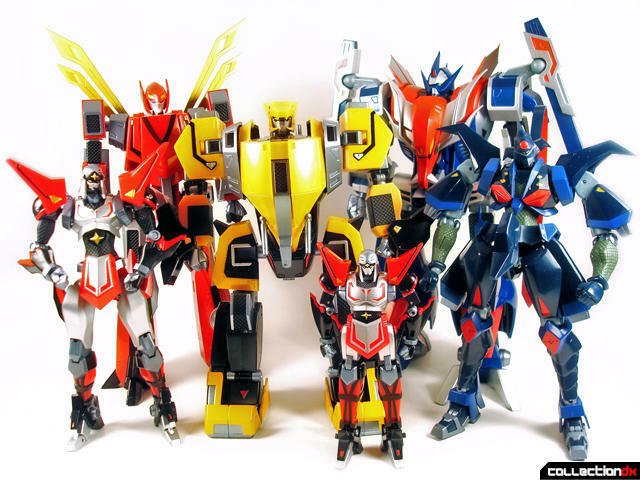 They all carry a very old school vibe while still utilizing technology acquired over the years in toy making. Very solid releases each and every one. You really can't go wrong. This review marks the perfect end to a great lineup of figures. This picture below shows everything you get for about the same you would pay for one of the bigger type gokins. 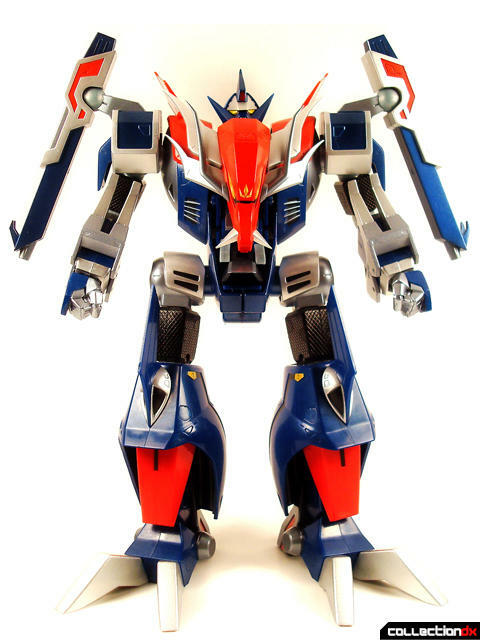 The GX-54, GX-55 and GX-56 are all available from HLJ.com so check them out. I own GX-54 and originally was not planning on getting this one... but you may have just changed my mind! "When we look at his face, we know instantly that no knock-knock joke will ever make him laugh, no matter how funny it is"
I've never seen the show,so I have no idea if it's necassary,but it seems like they should have included a flexible chain in case you want to have it post-firing. Again,I have no idea how it's treated in the anime.